It always seems good exercise to walk up the Red Stairs although, annoyingly, it never seems to get any easier. Nor do I think the number of steps reflects how many I feel it is. At the top, a gallery leads in two directions and along one of them is a small hallway from which leads the Canning Bedroom. It used to be full of stuff piled up, boxes and an old sofa. Part of the cornice was on the floor, the paint was peeling , there were no lights and the shutters were a wrestling match. The hallway outside was patched wooden floorboards and always dim given there was no proper lighting. It was not hard, however, to see the potential beauty of the bedroom or of this part of the Castle. The room was named for George Canning, a colourful politician who was Paymaster of the Forces, Treasurer of the Navy and Foreign Secretary for two years before fighting and being wounded in a duel with Lord Castlereagh, who was also a Minster at the time. The two politicians dislike of each other had almost paralysed the government and, following the duel, Canning was out of favour for the next five years, before again taking up a variety of political roles. In 1827, Canning was chosen to succeed Lord Liverpool as Prime Minister although some fellow party members resigned or refused to serve under him. Sadly he died in office just four months later in August 1827. Like other statesmen of his time, he was an outstanding student, renowned for his intelligence and oratory, although he came from what today we would call a dysfunctional family. He be began political life as a Whig but turned to Pitt the Younger and the Conservative Party during a deeply troubled time of disagreement in Europe. Canning commented as follows: “Italy: plundered, insulted, trampled upon”, “Netherlands: driven into insurrection”, “Holland: groaning under arbitrary oppressions”, “Spain: trembling at the nod of a foreign master”. Shall turn to the Pilot that weathered the Storm”. Highclere welcomed many statesmen over the succeeding decades and century from Prime Ministers and Minsters of State such Lord Salisbury and Disraeli to Lord Derby and Arthur Balfour, as well as key representatives from other countries. I am sure they ate well and enjoyed the cellars, listened to music and discussed history, plays and politics. Perhaps they joined their host, Lord Carnarvon, for walks to admire the trees and views in Highclere Park, to discuss knotty problems, before returning for a cup of tea and slice of cake. Thank you David Griffen for a beautiful photograph! Perhaps fortunately for them there was no television or social media or other means of instant communication, allowing time to discuss and consider, to read carefully the papers and weigh the facts. This may of course be a romantic view and clearly these days politics is just as difficult. Two hundred years ago we were closed out of trade with Europe with increasing taxes as our economy faltered with sustained inflation, increased food prices, unemployment, trade restrictions and fears of rioting. Because of the past (18th) century of planned prosperity, the British government were able to borrow long term at good rates. Today’s world is perhaps less convinced about the British economy going forward and we have yet to see what will happen next. To use Canning’s phrase, we do have a calm pilot and a Prime Minister who must be admired for her resilience in weathering the storm. History may not repeat, but its rhyme is bittersweet. In the meantime, Canning bedroom has been redecorated, the cornice is in place and the corridor is now properly lit. Time to move on to another bedroom! Greetings from the “colonies”! My wife and I watch and rewatch the episodes of “Downton Abbey” and are amazed that with each viewing, we see something that we overlooked from the previous viewing. It is such a fantastic series and has renewed a genuine interest British peerage. The actors that portray each character do so most excellently! I have always wondered that when the bell rings in the kitchen, that the names of the rooms are displayed beneath each bell. Are the names in the PBS series the same as in your house? Again, we hope to visit “the Mother Country” soon and stop by to envelope ourselves in that which we can only view on tv. My wife is a descendant of Lord Cecil(Cissel). The Downton kitchen scenes are filmed in a studio in London so the bell board is a fiction and contains fictional names. Our own bell board is located near the tea rooms at the rear of the Castle. The bedroom and hallway look absolutely beautiful! Thank you for the insightful history of the bedroom’s namesake. The political climate here in the US seems strangely similar and a testament to “ the more things change, the more they stay the same”. Thanksgiving preparations are in full force here, with the humbling, loving anticipation of family and friends gathering together. There is much to be grateful for. Thank you for your beautiful stories. Peace and blessings to you and your family. Thank you. You are quite right that most of us have much to be thankful for. Always enjoy your post. Loved the history of George Canning. Sadly, it sounds much like what is happening here, to our President. Nothing new under the sun. The renovation of the bedroom and the hall is lovely. Such fun. I love the windows and the view. Do you have a large storage area of original furniture that you can choose from for each renovation? Thank you for sharing your home and your life with us. 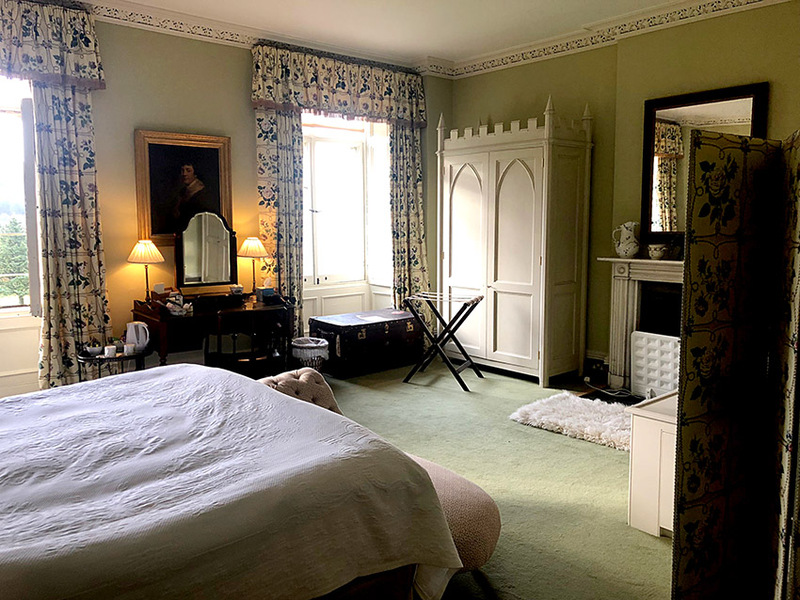 We do have a number of rooms at the Castle filled with furniture of various vintages, but I also work with our wonderful carpenters here and my friend Sarah Morris who is a heavenly interior designer to source the perfect items for each room. Will future rooms be opened to the public as redecoration has been completed? I can’t wait to return and see more! Thank you for your posts. I look forward to them every week! Yes, we are having quite a few restored with this in mind. I would love to have that cup of tea. A cup of tea is so restorative! What interesting historical details relating to the Canning room and the character of the man about whom it was named. All those important aspects of the players of the time of Canning give a rich depth to the history of Highclere. 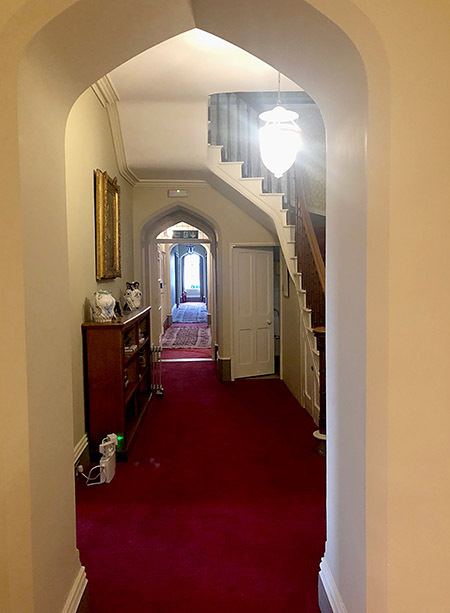 Thank you, Lady Carnarvon, for sharing an impressive Monday morning blog with the great before and after decorating photos. Highclere castle – always inspiring! Did you ever think your home would be so much a part of people’s lives? I have an idea for your gift shop – guess I can reach out to the shop manager? Thank you for sharing your home! It is a very humbling experience. Please send any ideas you have for the gift shop. 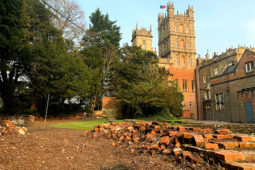 Would love to see more “before and after” photos as you update areas around Highclere. You’re right – we must take more ‘befores’, sometimes we are half way through before I remember to take any photographs! You have done a beautiful job restoring the bedroom and the history was most enlightening also. Thank you for the snapshots of Highclere and letting us have glimpses inside. I love reading your blog! Thank you! Congratulations on a beautiful restoration of the Canning bedroom. More good fortune going forward! It is charming- a recovered chaise long found in another room, an old trunk from somewhere else, chairs from another room, an old plain cabinet painted a quirky green and thus a bedroom .. It is always such fun to read about and see what is taking place at Highclere, how many bedrooms are there in the castle? The history of the castle is amazing and you are so generous to share it with us. May wonderful blessings rain down on you and your family as we approach the most wonderful time of the year!! It is always fun to hear the historical anecdotes and see the rooms you have transformed. They are beautiful! I love the stories behind each restored bedroom and the notoriety they each enjoy. 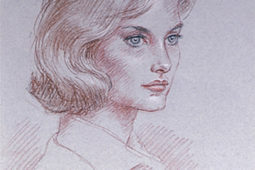 Thank you for sharing your life at Highclere with the world. Keep ’em coming! What a beautiful restoration, and wonderful view from the bedroom window. I’m now going to go and make a cup of tea and have a biscuit. Thank you for sharing your projects, life and historical context of Highclere. Your blog is one of my favorite reads while I have a cup of raspberry tea every week. Thank you so much for sharing pictures of the Canning Bedroom. For a minute I thought you kept supplies for preserving food in there! 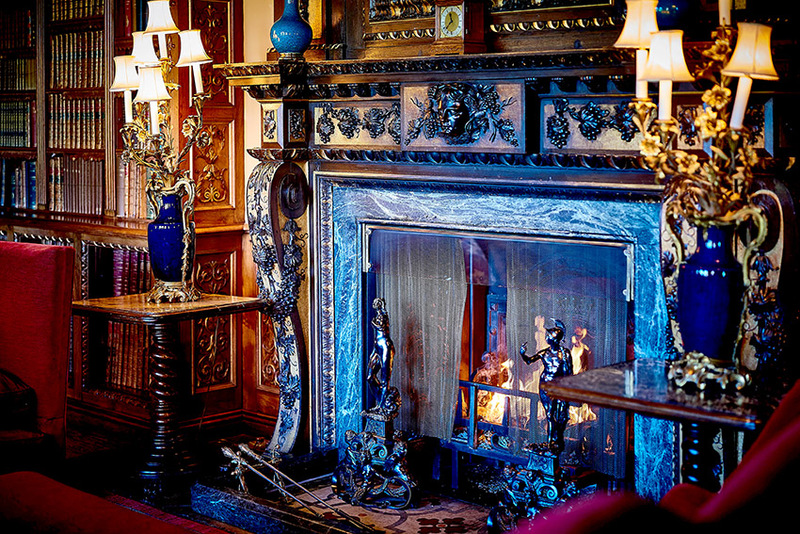 I am in love with that blue fireplace. Part of it is the garlanded grapes. I think that must be the Italian in me – the very images of grapes speak to me. I hope you don’t mind, I downloaded a picture to use as wallpaper for my computer. The original fireplace may be in Highclere but a little piece of it is here every time I walk my my desktop. Speaking as one who has been continually involved in renovations my entire life, I have great compassion for the sawdust and plaster dust you must have endured. I sometimes think I should bleed plaster dust rather than blood! But the end result is so rewarding as your pictures clearly show. I admire your devotion to restoring the Castle. Your attention to detail is wonderful. I want to move in to that bedroom! Thank you for sharing it with us. Our Thanksgiving is this Thursday. One of the things I am thankful for is your blog. It gives me something to look forward to every Monday. I pray you and Lord Carnarvon are BLESSED during this special time of the year. Thank you so much for all you do. I have not yet slept int his bedroom which I would like to do to get a sense if it and if something is missing..
My husband and I visited in late October of this year and chatted with you after the tea time. I love what you you are doing to restore and preserve such wonderful history and an amazing home. Keep up the good work! My husband and I have renovated a number of our homes and find it to be a very satisfying creative endeavor. Now I long to find my own castle to restore! Is the Canning bedroom on the second floor? I remember hearing there are more bedrooms on the third floor and just wondered. Canning is on the second floor with beautiful views to the south. I really enjoy seeing the before and after pictures of a restoration or renovation, they give an insight of all the work that goes into making something come alive again. On a different note, somebody in the British Period Drama group posted information about the Downtown Abbey exhibition that is going on in West Palm Beach, Florida. Some friends told me about it too.. Thank you for sharing your renovation and castle photos, an interesting history lesson, and your insights today. The Canning bedroom is stunning! I am always amazed when I see your renovation photos. The attention to detail is incredible. That fireplace! It’s drop dead gorgeous. It was fascinating to read about George Canning and the political issues of his day too. Oh, how his words ring true today! Your prime minister’s resilience and dedication is remarkable and admirable. These are certainly interesting times. As we pause to give thanks in the U.S. this week, I wish you all continued blessings and the best of luck with your next renovation project. It is an amazing photo!! As usual interesting post and photos that make me wish I could stand in front of that gorgeous fireplace , then sit quietly drinking tea and eating cakes and listening to the sounds of the glorious house! What a fine job of restoration, the Canning bedroom is so inviting, and I imagine it is full of sunshine as it faces south. May you continue such fine work with all the many rooms of Highclere, as you have a magic way of shaking off the dust and clutter and bringing life and warmth back into each and every room. Someone asked as to how many rooms there are at Highclere, and I read once that the answer was “about 300”, though no one is actually sure of the exact number! Good luck! And yes, Thursday is Thanksgiving Day in the USA, and we have so much to be thankful for. Special thank you for these wonderful blogs and sharing your home and its history with us. Lady Carnarvon, Was this the bedroom used as Cora’s bedroom in Downton Abbey? The dressing table and the lamps look very familiar. I wonder if there is any link with The Canning Stock route which it a early history of western Australia. In early days of Swan River colony from 1830’s southward bringing cattle all the way from the North West of WA. It is now a tourist track, and links the watering wells all the way south, great for four wheel tourists. WA early used British names a lot of exploratory places in 1850’s onward. 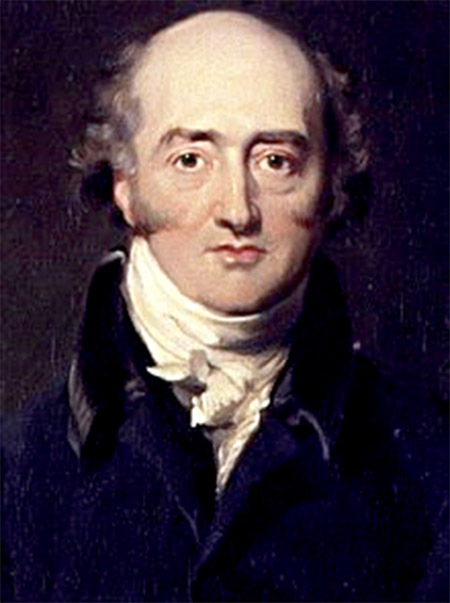 I think that was a bit later and not this Canning – 2 of his 4 children died his son had no children, but his daughter married a man called Ulick John de Burgh and I wondered if it was the Jane Austen’s character Catherine de Burgh in Pride and Prejudice!!! I am sure fanciful on my part.. I also seem to remember a bathroom with green ivy wallpaper but I can no longer be sure…. I am not sure when this was – it sounds a while ago and not like my husband!!! Just wanted to write and tell you how much I enjoy reading your posts. I sit down with a cuppa and just imagine I am there. You have the wonderful ability to take me away from my worries and everyday jobs for a little while and I wanted to Thank you for that. Also I adore the photo of the Cup of Tea. I can’t stop looking at it. 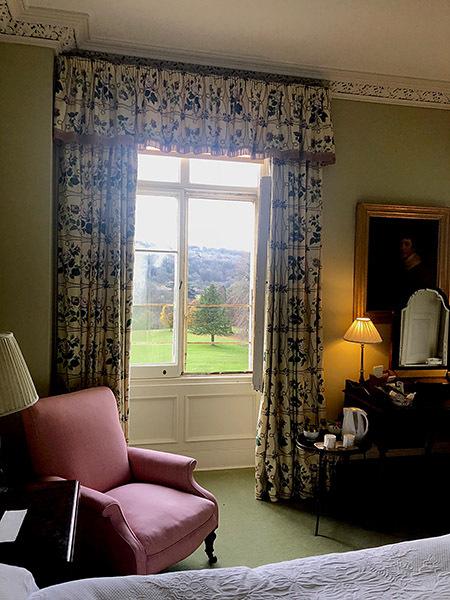 I very much enjoy all that you write about the castle and views of the rooms are of particular interest as I can imagine Frederick relaxing there with a glass of wine and a cigar, perhaps together with Disraeli who bought the shares in the Suez Canal following a tip off from Frederick. Thank you. I know a little about the subject of the Suez canal shares – they were bought in November 1875 by the British government due to the bankruptcy of the Khedive of Egypt. Disraeli purchased a controlling interest of nearly half the total shares in the Suez Canal Company. Since Parliament was not in session at the time, he borrowed £4,000,000 from the Rothschilds (Almina Carnarvon’s father and brothers)who arranged it at short notice but Disraeli was a close friend of Almina’s father Alfred de Rothschild often staying with him in Seamore House in London which was then left to Almina! What a lovely “new” bedroom. I love the drapes and that view is quite something. My sister and I are planning a trip to your home next September. Cannot wait. 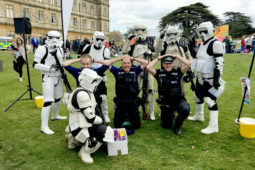 Thank you – we are going to put the 2019 summer tickets on sale next week – just again testing the computer programme! Thank you for another well told history lesson and the beautiful photographs of the latest restoration project. You did have me wondering, before I read your blog, why there was canning being done in a bedroom. You and Geordie are such exemplary caretakers preserving the past for the future heirs of Highclere. thank you for sharing the before and after photos, you have very good taste. I much prefer subtle and elegant colours and furnishings, and am not a fan of modern taste- everything grey and chrome ugh! If you were to name a bedroom after an influential visitor of the 21st century, who would it be? The Fellowes room, or Grantham for example? An interesting conversation if ever there was one! At first I thought you were sharing about canning food in the kitchen. . Fascinating history- I love it and the bedroom decor – very peaceful. Bless you. 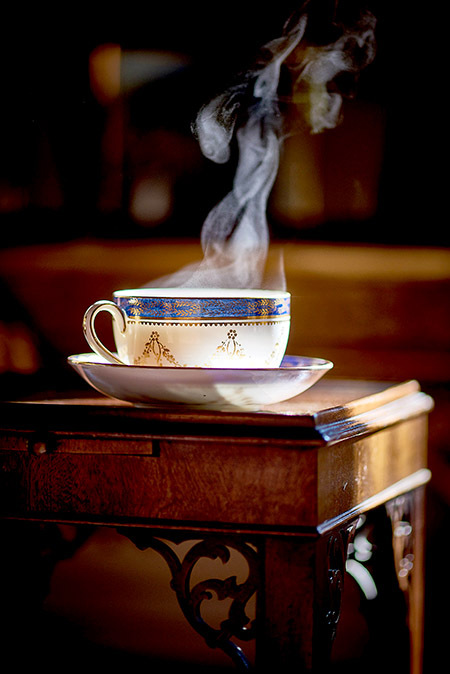 The steam from the exquisite china cup looks like a flamenco dancer rising from a very British tea. Thank you for sharing your renovation projects at the castle! I am from NZ so can’t visit the castle although of course I always dream too! I love and admire the way you are lovingly restoring each room bit by bit. Amazing and beautiful work. I really am facinated by it all and all of the castles history also …I have read some of your books and really enjoyed getting to know the history . Thanks again for sharing. I love reading about political figures with what could be aptly termed “fire in the belly.” Thank you for this little history lesson and now I have some one to research and try to chase down book (s) written about him and his time his British history. Of course, I perhaps would never have known about him and also might have read about him and have glossed over it. Your home gives us so much and I pray generations to come will be rewarded as we have by your stewardship and your willingness to share. Best regards and as we gather for our annual Thanksgiving meal, I must also say thank you for all you do in sharing your home as well as all you do for war veterans. Blessing on you and your family. I’m new to the Downton Abbey series (if you can believe it!) and found your blog while researching your amazing home and movie set. I must admit that I thought you would be sharing what fruits and vegetables you had preserved for the winter with home canning! However I enjoyed learning more English history and more about your restorations. Thank you! ” THE REGRETS OF THE GOOD AND THE FEARS OF THE WISE SHALL TURNS TO THE PILOT THAT WEATHERED THE STORM ” THESE WORDS REMIND ME OF THE FUTURE PRESIDENT OF BRAZIL. – JAIR MESSIAS BOLSONARO. I have seen all the episodes of Downtown Abbey . And I Wonder a thing about the watches . On them it is a sign we’re it says Lady Caroline ? What does this meant ? TODAY, THE US IS CELEBRATING THANKSGIVING . BLESS BE THE TIES THAT BLIND OUR HEARTS IN CHRISTIAN LOVE. I always love reading your writings. With each one you seem to transport me to another time and place. Love the history information and a reveal of a bit more of your beautiful home. I can feel the warmth from the fireplace and the steam wafting from the cup of tea. The bedroom looks spot on! Thank you for sharing and looking forward to your next adventure! Such as great story on George Canning and Highclere being part of these illustrious minds in history. The large window tells so many stories! The view looks beautiful. Always an adventure reading about Highclere Castle and the eighteen and nineteen century life. I mention the 68 clock downstairs in the servevants Hall . It was only a detailed thing I have noticed . Your dogs are very cute . I really like your picture of you and the dogs . And is ‍♀️ difficult to do? Firstly, thank you for sharing. The above message and incites, photographs and comments are with both dignity and with style. I have just spent may hours sifting through various parts of your website, enthralled by the story, amazed by both history and pictures, humbled by the your dedication and the dedication of your family in preserving and when possible restoring your stewardship of a great and loved legacy. I comment only in passing that this is the first social media sharing (of this type) that I have taken the time to entertain and experience. I used the term social media experience as I feel that it better expresses a more apropos description of the time, care and dedication clearly visible in what you present than the pedestrian term of “blog” implies. Whilst we do not know each other as we have never been introduced, have not met nor know anything of each other, what you share onsite is is elegant, thought, engaging and presents such a warm friendly feel to it all, I would simply like to say once more Thank you. Thank you – you really are too kind. I am just a multi-muddling Mum trying to do her best. You have done a lovely job with the restoration and redecoration of this room, as you have with so much of the rest of the house. As an interior designer, I have a particular interest in everything you do with the place. The estate and castle itself could not possibly have better stewards than you and your husband. What a lovely surprise to find yet another connection to Highclere, too! William Pitt was, of course, the founder of Pittsburgh, Pennsylvania, USA, which is my home, and where I was born and raised. The first connection we have, you ask? I was astounded upon starting to read your books, as probably the 120,000,000th fan of Downton Abbey, to realize that your husband and I are actually 12th cousins three times removed – through Almina’s father, who was my 11th cousin once removed. Our common ancestor was Jacob ben Akiba Gugenheim. I don’t think I’ll be able to get back over to the UK in the very near future, but the next time I’m there (or if you should find yourselves coming to Pittsburgh), I do hope we will have a chance to meet – and in the meantime, to hopefully get to know each other a bit online. Please feel free to email me if you wish, and I will be happy to send you a link that will show the line between your husband and me, which I really don’t feel comfortable making so public. The great joy of having begun working on my family tree has been finding and getting to know relatives from all over the world, in some of the most surprising places. I am just fascinated by the size and breadth and interweaving of the web, and have met absolutely the loveliest people all over. Thank you for that fascinating bit of history. The Canning Room is lovely and worthy of Highclere! It is wonderful that you could see the loveliness even in the midst of the disrepair. “Always look on the bright side of life” – it is a good song I can hear it in my head!! !